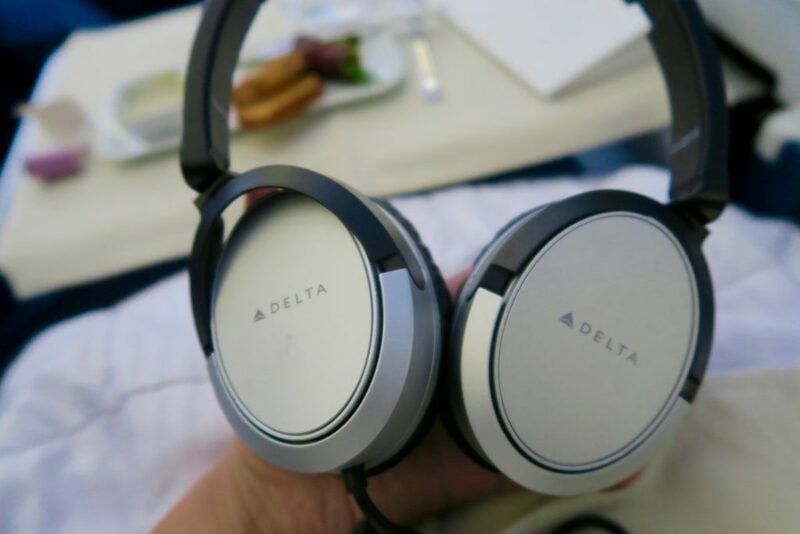 Flight Review: Delta Air Lines Business Class DL 40 Sydney to Los Angeles B777-200 LR - Holy Smithereens! The very popular Sydney to Los Angeles route now has about 5 direct flights per day with various airlines. One of these is Delta Air Lines, which started flying into Sydney since 2009. Seven years on, Delta Air Lines is going strong, forming an alliance with Virgin Australia and together, offer twice daily flights from Sydney to Los Angeles. On my recent trip to Ecuador (Galapagos), I took Delta Air Lines from Australia to South America and vice versa. We spent a few days in Florida (Orlando) on the way back hence taking an American carrier was more logical than a South American one. The journey, as you can imagine includes a lot of segmented flights. 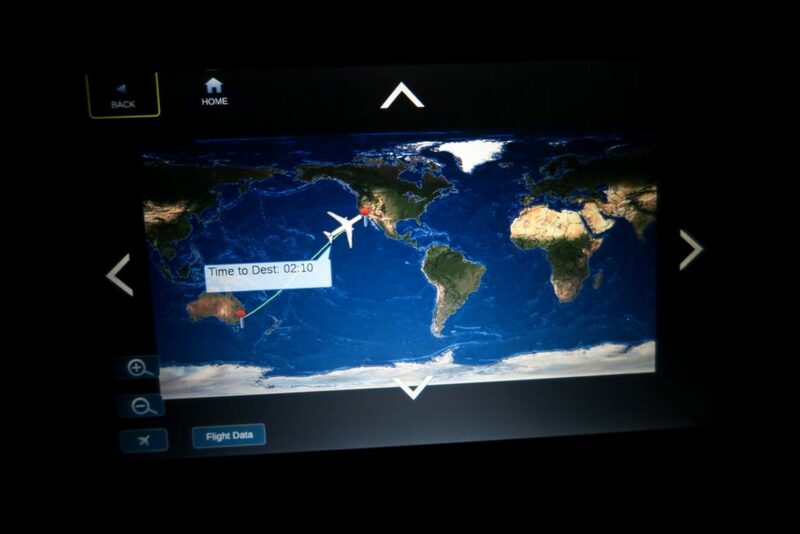 But the longest and biggest chunk of this flight is from Australia to the United States (Sydney to Los Angeles). 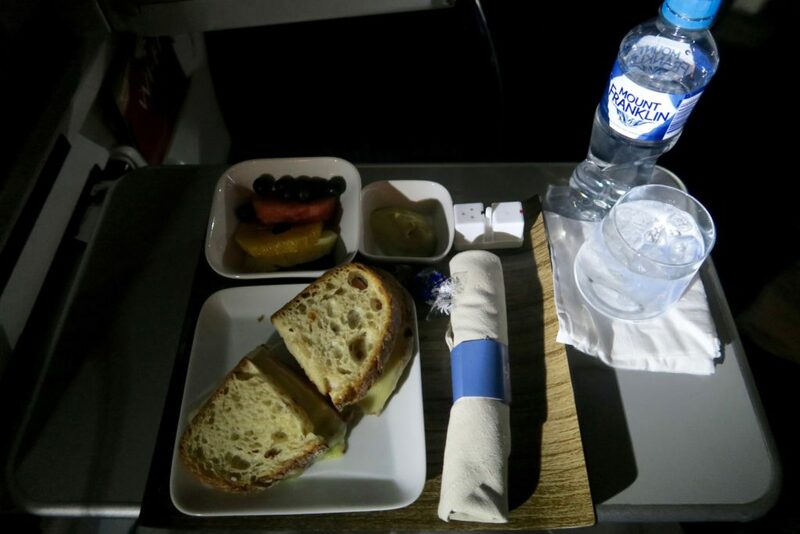 So here is a detailed review of DL 40 Delta Air Lines Sydney to Los Angeles on Business Class. 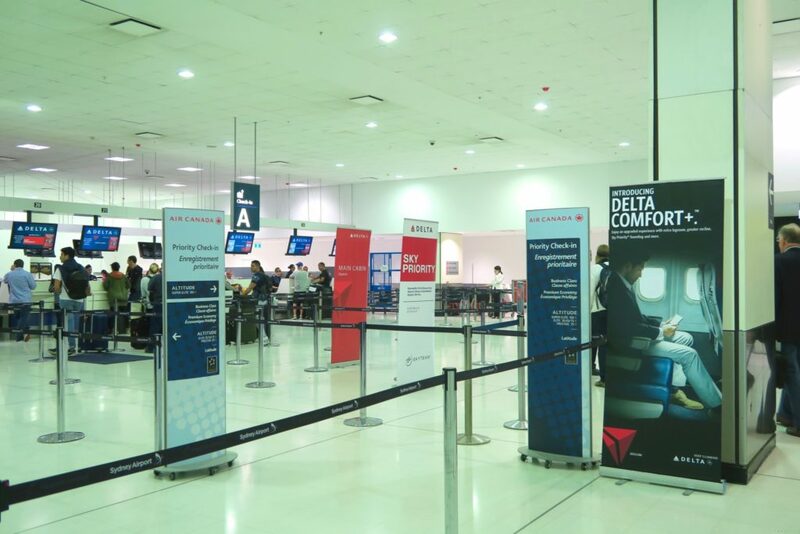 Delta Airlines’ check-in desks are located on the far left of Sydney Airport. The departure time of 10 AM means check-in would be around 7-ish – 8am, quite a busy time at Sydney Kingsford Smith International Airport. The check-in desks of Delta Airlines feel like a refreshing organised change from the busy to and fro-ing of people near the entrance of the terminal. Check-in was extremely quick, no fanfare, and we were given express passes to go through Immigration. 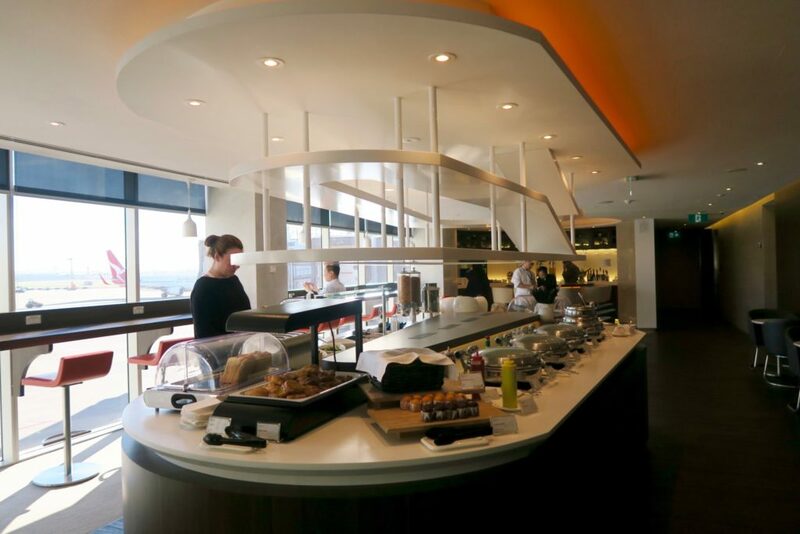 Being a member of the Skyteam alliance, Delta uses the Skyteam Lounge at Sydney International Airport Terminal 1. 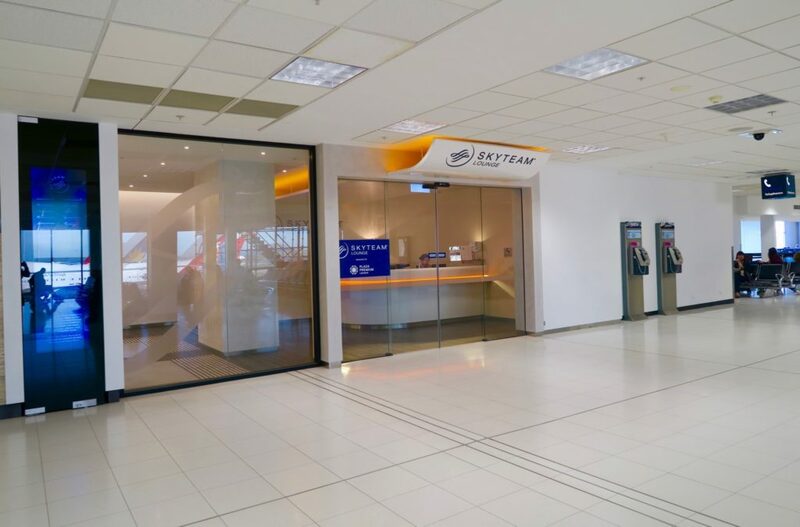 With 20 different member airlines, I was expecting the Skyteam Lounge to be busy and full, especially given the peak departure time. But I was pleasantly surprised to find it really quiet and private. It was a respite from the busyness of that part of Terminal 1 at Sydney Airport (where there currently are a lot of maintenance / construction happening). We were given complimentary Wi-Fi access and the staff was quick to remind that there will be no boarding announcements or reminders so we have to be independently aware of our boarding times. The lack of boarding announcements gave the lounge an even more serene environment which made it a pleasant place to rest and catch up on some work. Delta One the product name for Delta’s Business Class service / cabin for all its long-haul international flights, along with cross-country Los Angeles – New York flights. Upon boarding, we were immediately offered drinks and newspapers. 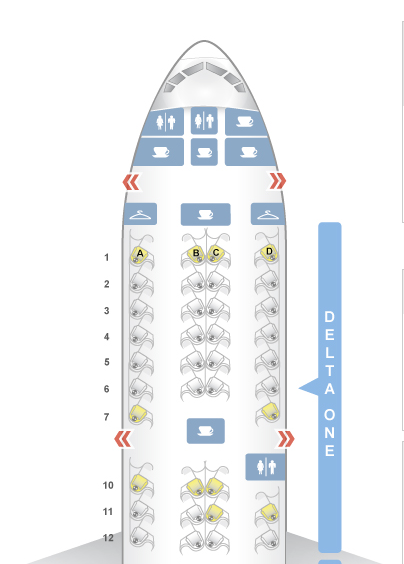 It is a 1-2-1 configuration on the Delta One cabin, which means that everybody has aisle access. As you can see from the seatmap, the seating angle is a herringbone style. If you’re travelling alone, the window seats are the obvious and most popular choice. 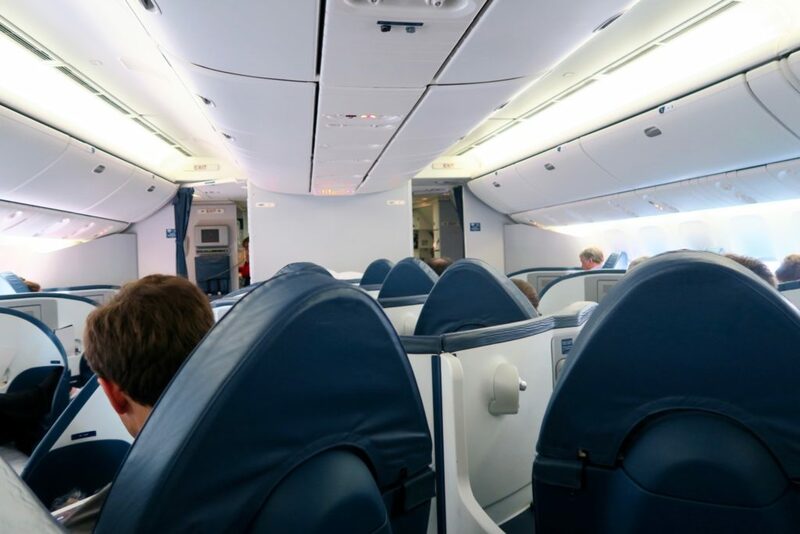 People travelling together are inclined to take the two seats in the middle, but because seats are designed to have the passenger’s head positioned and faced away from each other (refer to cabin photo), interaction may be a challenge. If a travelling pair booked a window seat and its parallel seat in the middle, I believe there’d be more chances of seeing or even sighting each other. The seat pitch is 78 inches (198.12 cm) with a width of 21 inches (53.34 cm). The photo above is with the seat in its flight position (normal seating position) with my legs fully extended. I am 5’4 and my feet barely touched the “Ottoman” end of the seat. 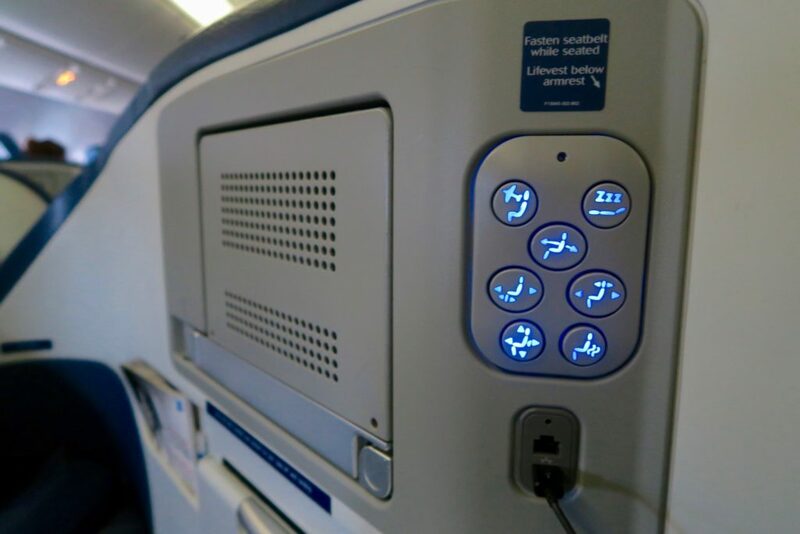 A few clicks on the seat control (moving the seat forward) will have my feet resting on it. If you are taller than me, (which will very likely be the case!) you may find it easier to rest your legs on the ottoman (like that passenger to the left of the photo). The seat control pad was no-nonsense and pretty easy to use. What I loved about this is the bottom right button. It’s a massage mode for the chair that was truly relaxing. It didn’t just vibrate, it had a real deep tissue rolling-ball mode. 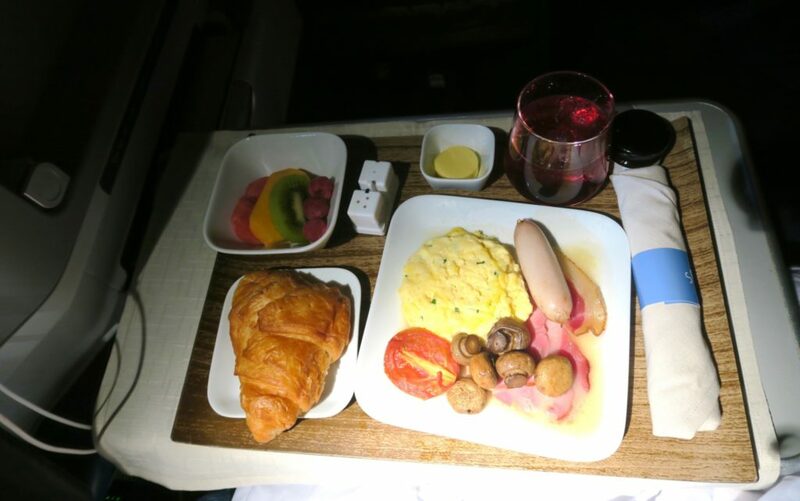 With a departure time of 10AM and arrival time of 0645 AM , the two main meals served were lunch (it can be a big brunch) and breakfast. 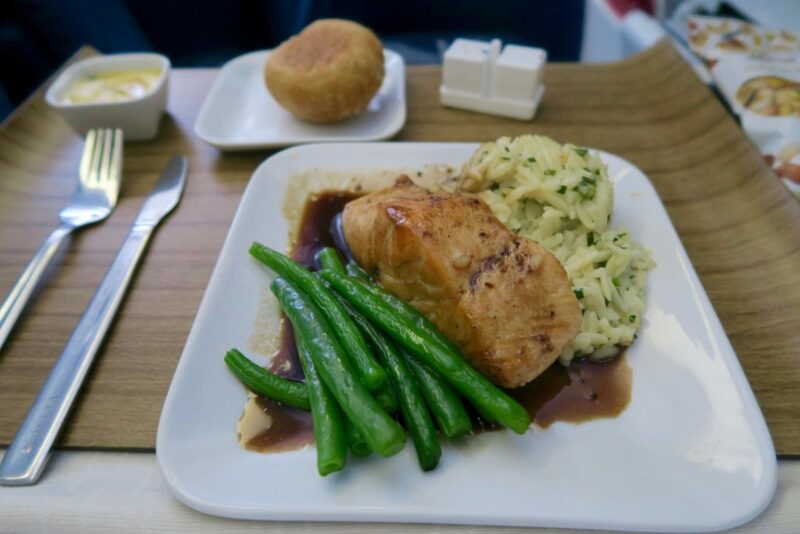 *Upon request, Delta offers a “Dine & Rest” option in which your meal will be delivered once as a single service* – this option is perfect for red eye flights, or for those just wanting to eat quickly and either work or sleep. The menu stated Vanilla but they came out with a choice between chocolate and vanilla. 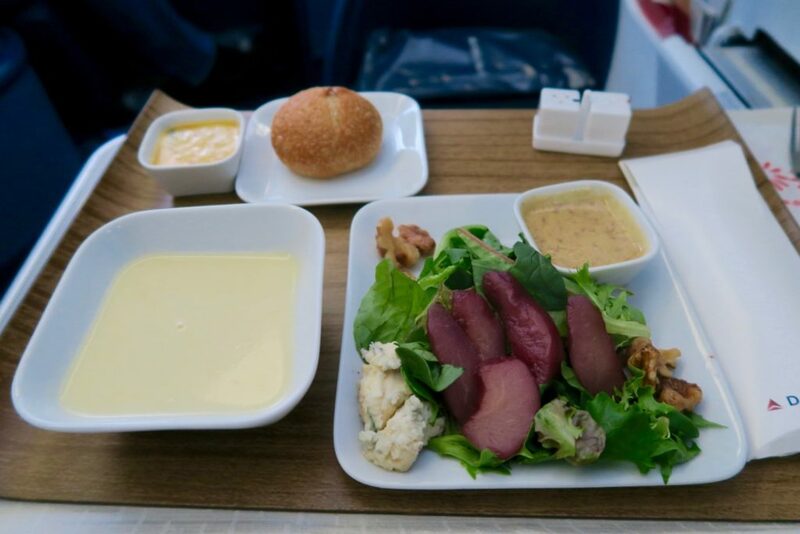 In-flight meal verdict: Though I found the salmon sauce (lunch entree) a little bit too sweet for my taste, I enjoyed all the meals in general. I really liked that they put a fun spin on serving the dessert. 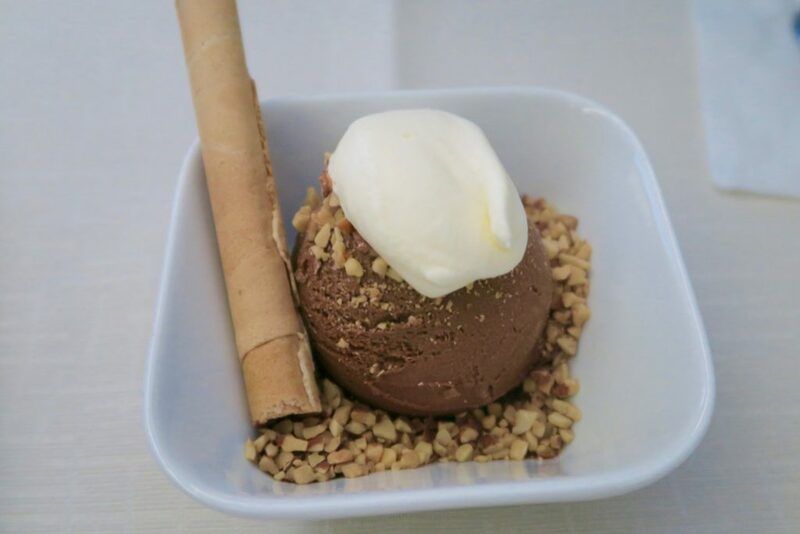 Ice cream is always a treat on air, but more so when its not just in a cup, but served whole in a dish with your own toppings to choose from. Prior to take-off, we were immediately given the goods. Headphones, pajamas, slippers (yes!) two pillows, a blanket, and a toiletry/amenity kit. 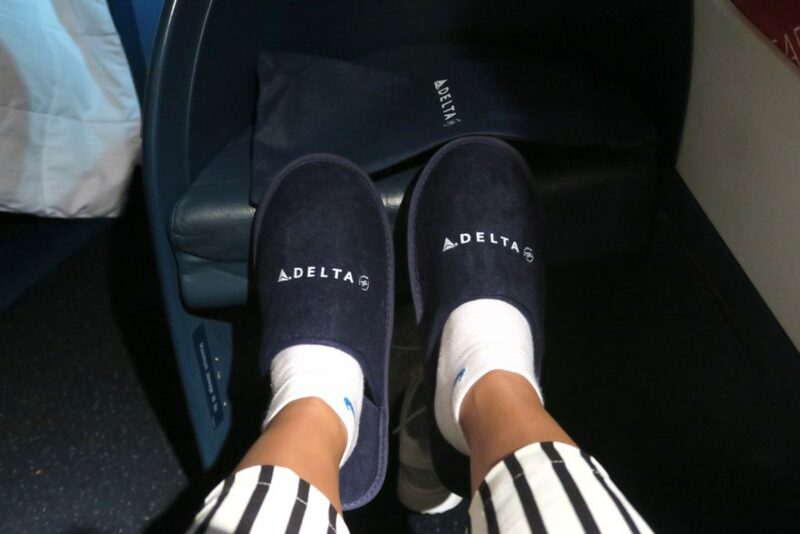 I was really impressed with the pajamas AND slippers, especially on business class. The slippers were really an impressive touch, as I believe they are a luxurious treat even in Business Class. This dramatically improved my overall in-flight experience as it made it really easy to shuffle around the cabin, especially when using the lavatory. The noise-cancelling headphones were really comfortable and provided great surround-sound. I was slightly surprised though, that they collected these headphones before landing. 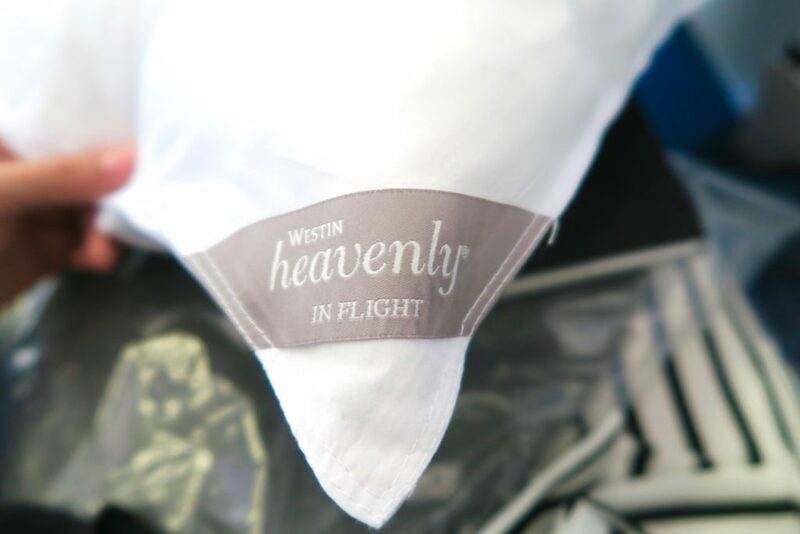 Delta started using Westin’s (of Starwood Hotels) Heavenly In Flight beddings in 2013. 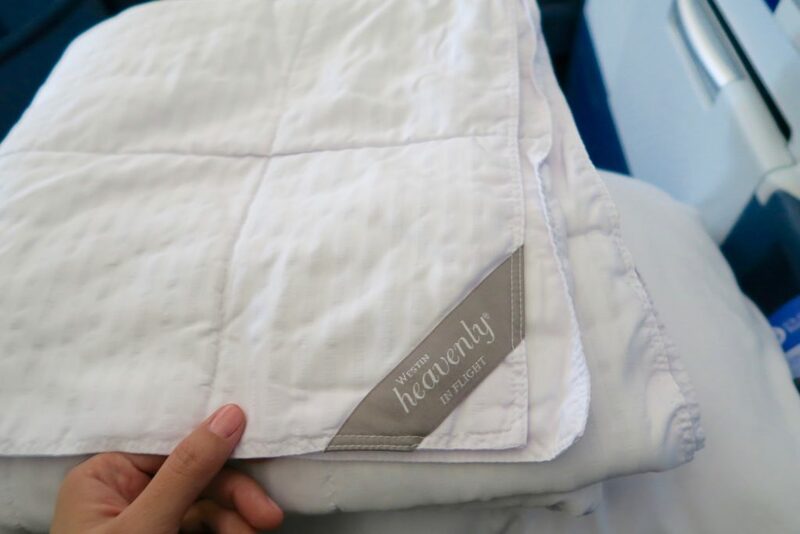 In this flight, we received two pillows: a hypoallergenic sleeping pillow, which at 18×22” is almost the size of a standard pillow. And as the flight was over 12 hours, we also received a lumbar pillow. For a blanket, we received an oversized comforter. 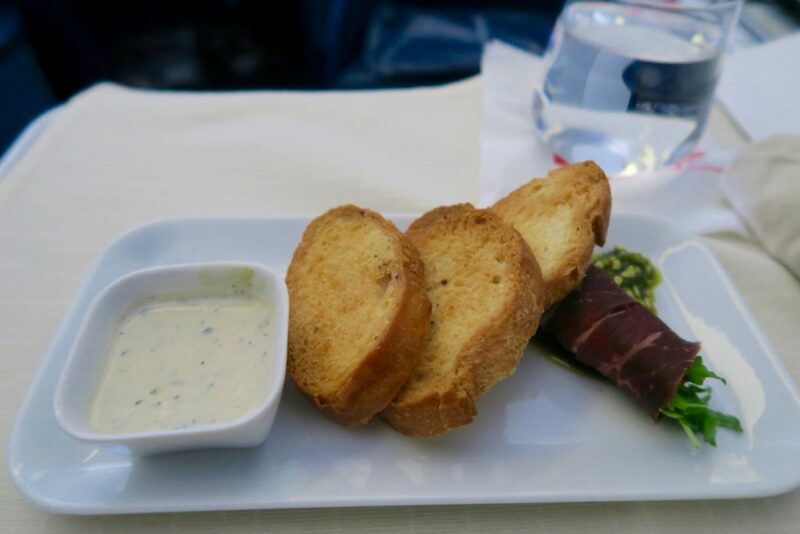 Now this, I have to say, is the best aspect of my Delta One experience. If you look at the Delta One seat itself – yes, it lies flat, it has enough room and a massage option. 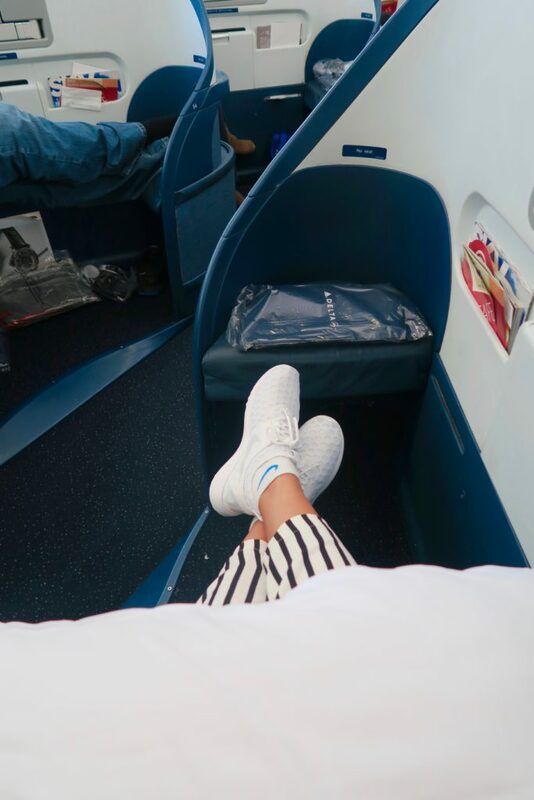 It isn’t the sleekest or most modern business class seat, yet I had one of (if not the most) relaxing and restful sleep in business class in a long time. And this was not even a red-eye flight, so that’s saying a whole lot. 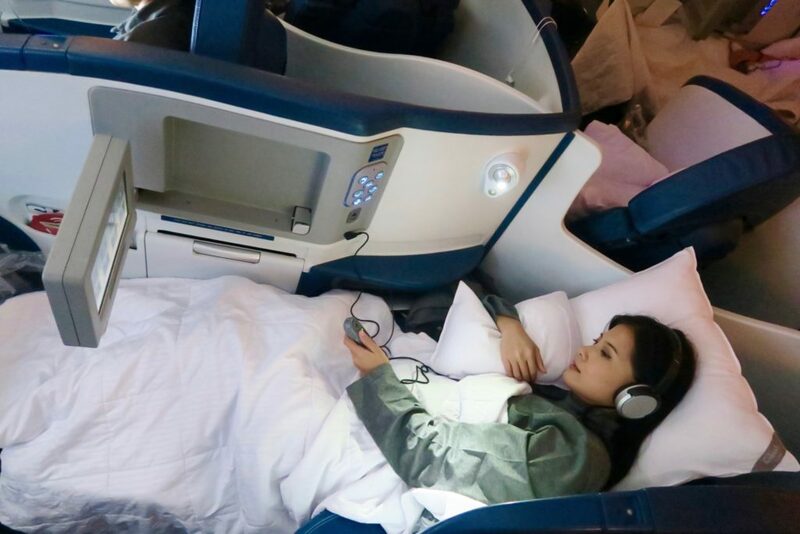 There are many factors to a restful sleep in flight, and I truly believe that my exceptional sleeping experience is hugely due to the wonderful bedding. The almost full-sized pillow had the exact ratio of fluff to firmness that I seek in pillows, and along with the pajamas, slippers, the lumbar pillow and comforter, it created an as close-to-a-hotel-bed experience. The main pillow’s size helped a lot. 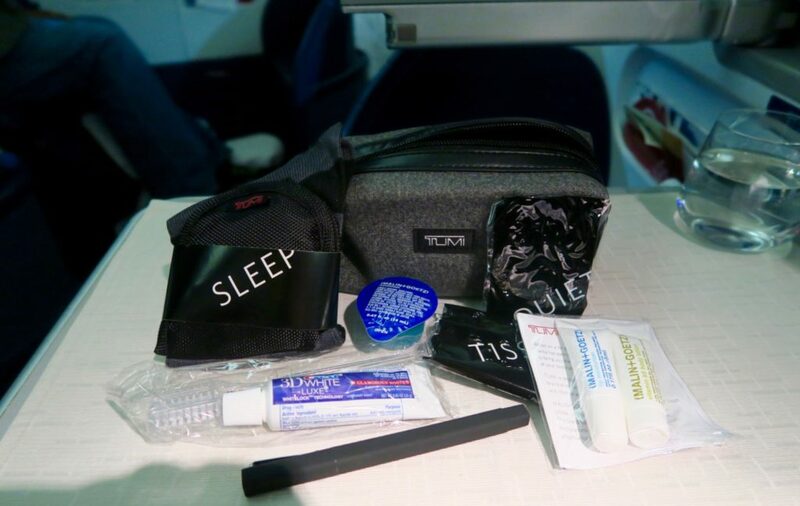 It didn’t budge at all during my sleep – which I find is the main cause of most of my sleep disruption on flights in business class, as most airlines offer mini or half-sized pillows. The comforter, while extremely lightweight and does not have fancy texture (velvet or plush), still contained enough density. It kept me evenly warm throughout the flight. I find that most blankets in premium classes on other airlines tend to be on the heavier side. While this is great to have in the beginning of the flight ( a time when aircraft temperature is at its coolest), I often wake up in the middle of my sleep in a sweat as the heavy material does not accommodate for the temperature change. Not with this comforter. I slept a good 6 uninterrupted hours during the flight, honestly a first in any flight. When I woke up, I realised that the complimentary in-flight Wi-Fi was working (prior to sleeping the server said we were in a no-signal zone), so I managed to post an update on Instagram. The rest of the time, I used the in-flight entertainment. I admit I had serious thoughts of taking with me the Westin pillow and/or comforter but I highly doubt that the bulge in my bag would be very discreet (if they would fit at all!). But yes, those pillows were that good. 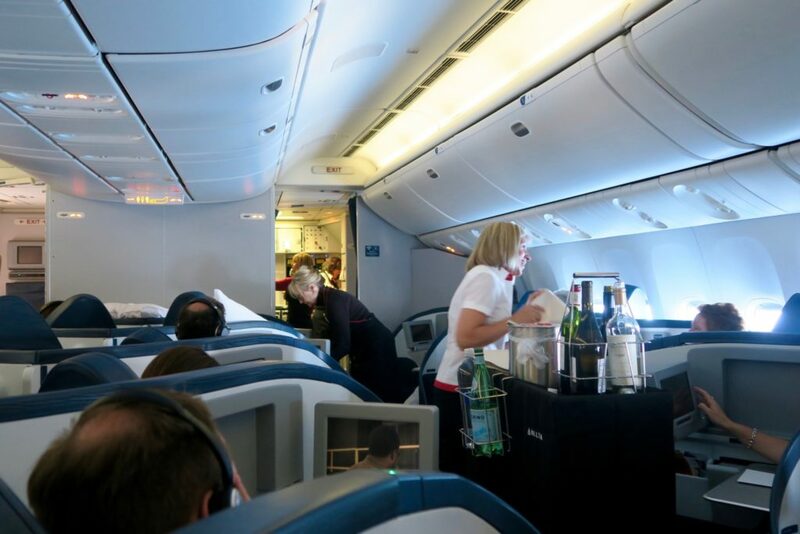 Delta boasts of an in-flight entertainement worth over 300 movies, HBO, SHOWTIME, 18 channels of live satellite TV on select flights, 2500+ songs, TV and games – and very rightly so. Ok, the actual monitor and remote may not be the most modern I’ve seen on aircrafts but I’m seriously impressed by the wide variety and the sheer number of movies they have covered in the flight. Think of movie hits in every decade, they have it. From Funny Face, Here to Eternity, Steel Magnolias, Clueless, Good Will Hunting, You’ve Got Mail, to recent blockbusters like The Intern, Joy, Brooklyn and Deadpool. And this is not just on their long-haul international flights. We took several other Delta US domestic and US to Ecuador flights and even on those comparatively shorter flights, there was a plethora of movie choices, including foreign films. 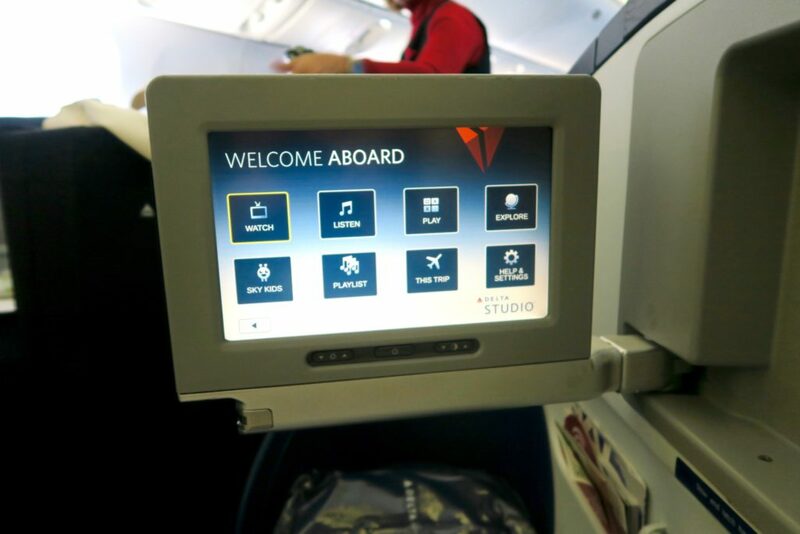 Delta also offers in-flight streaming using Gogo Entertainment but (so you can watch movies through your personal device) but I did not try this. Amenity kit is by Tumi. Tumi creates wonderful and extremely durable travel kits. The last time I had a Tumi in-flight amenity kit was three years ago with Malaysia Airlines, and to this day I still use it as a travel makeup bag. 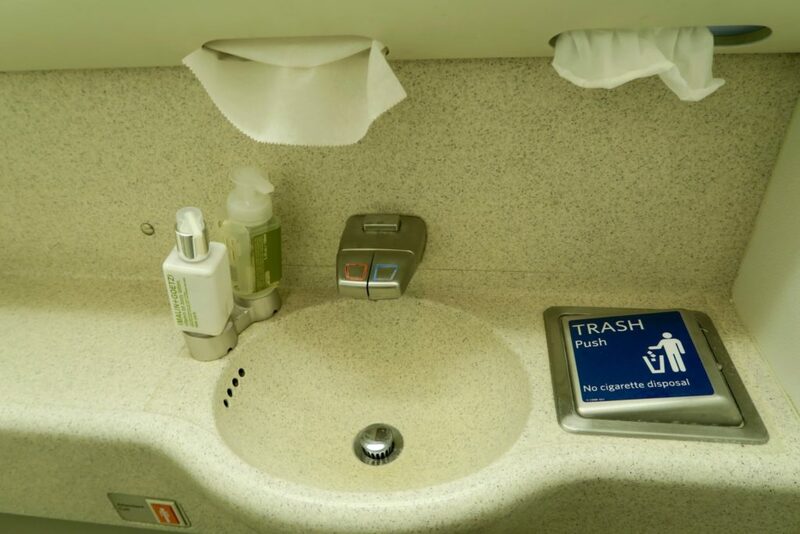 Lavatory was kept simple and extremely clean throughout the flight, even towards the end. Handwash and lotion are also from Malin + Goetz. I find the cabin crew of Detla Airlines in Business Class to be really attentive and accommodating. The two female cabin crew in my zone always ensured I had enough water throughout the flight, and regularly checked on me (and other passengers). As I spent the last hours of the flight wearing my headphones watching movies, one of them constantly used hand gestures with friendly expressions and mouthed short phrases along the lines of, “You need anything?” or “All OK”? I thought this was especially considerate and thoughtful as it allowed me to still communicate with them without having to remove my headphones and pause my movie. Yes, I’m aware that this “to-remove-or-not-to-remove-the-headphones” predicament is all too inconsequential, but I’m sure you all know what I mean. 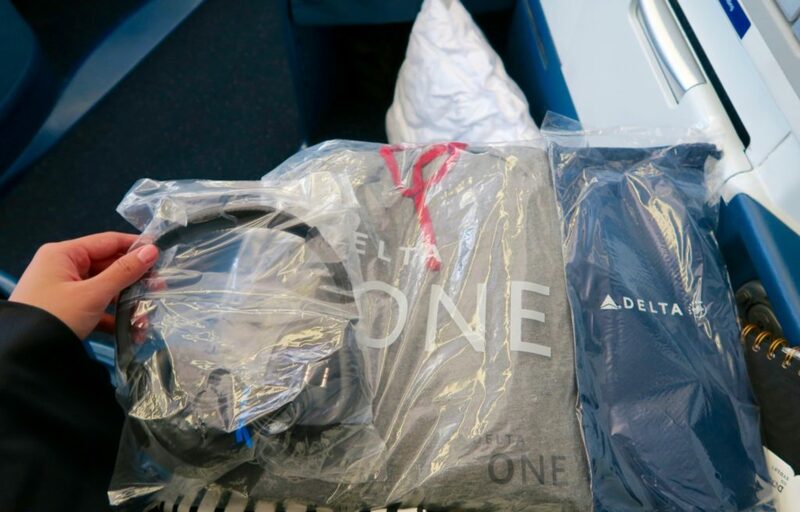 This was my first long-haul Delta Airlines flight and I’m sure it won’t be my last. 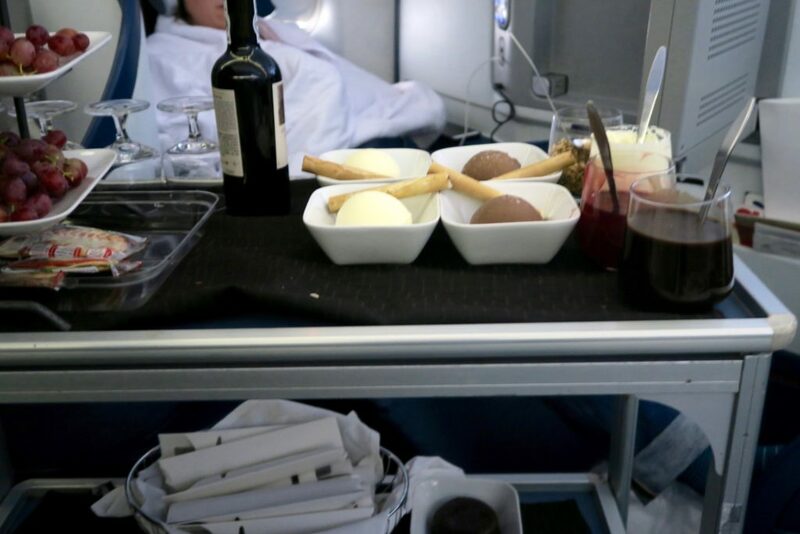 Attentive service, amazing in-flight bedding which led to a most peaceful sleep, a sundae trolley and endless choices of movies and tv shows – those are my top highlights of the flight and they are more than enough reasons to make me a repeat passenger. Another reason to take Delta: Being based in Australia, where we are geographically far from both North and South America, I find myself wanting to hit two continents (or countries) in one travel. 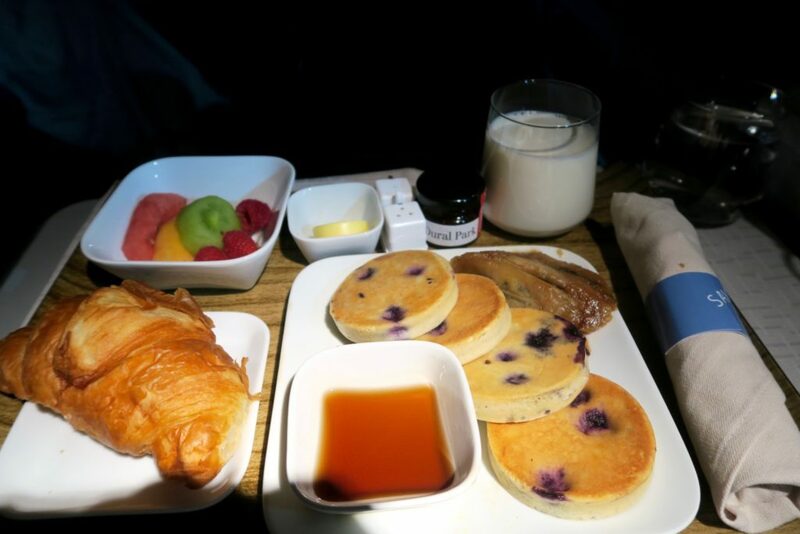 Delta Airlines was a great choice heading to South America as it’s base is in Atlanta, in the southern end of the United States. Hence, the flight to and from Atlanta to South America isn’t too long or grueling ( it was 5 hours Atlanta to Quito). We also wanted to stop in Florida on our way back to Sydney so a stopover in Atlanta to Orlando from Quito wasn’t too bad as they were not too far from each other. Delta Airlines flies daily from Sydney to Los Angeles, and together with their partner airline Virgin Australia, connects Sydney-siders to Los Angeles twice daily. Have you flown Delta Airlines before? 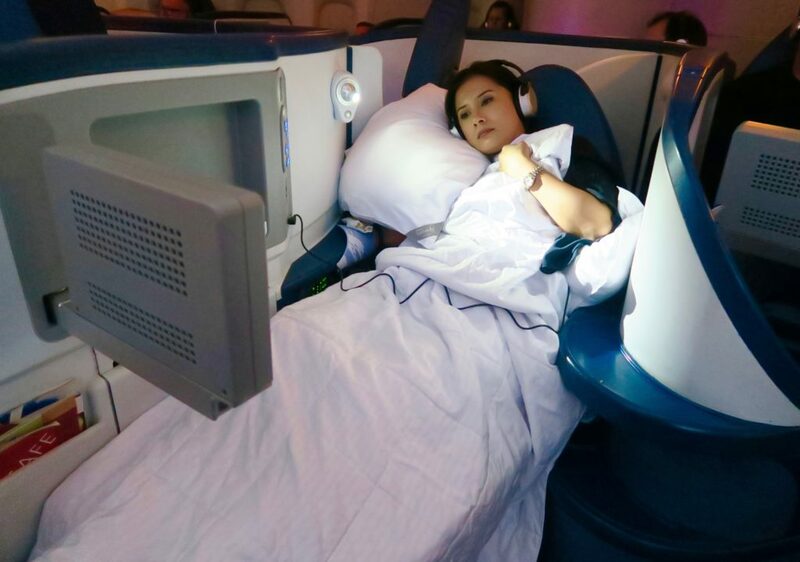 When was the last time you had a blissful sleep during a long-haul flight? Good to read, this sounds like a great flight. A full size pillow would be a real treat. We just did the Dubai – Sydney flight on Emirates in Business Class and I slept for 8 hours!! The flighter left Dubai at 2.15am so I was really tired and ready to sleep. Then we got into Sydney at 10pm and went to sleep about midnight at home and I slept all night. Beauty!! Love your food descriptions and all the details. Hi Seana, wow 8 hours sleep on air is phenomenal! Must have felt like a dream 🙂 2:15 am departure sounds painful – I’m sure I would have been knocked out too. But yes, arriving at 10PM is great as you get to have a full sleep again! This looks so comfy! I wonder if I’d pay for it even if I had the money. I think I’d always like to spend my money on something else. Now if it was a business trip, that would be another story! I’ve flown this exact flight before (in 4D), and even though this is an older style of Delta’s business class seats, I find I sleep really well in them and appreciate having more leg space than in their A330 and 767 seats. Hi there! 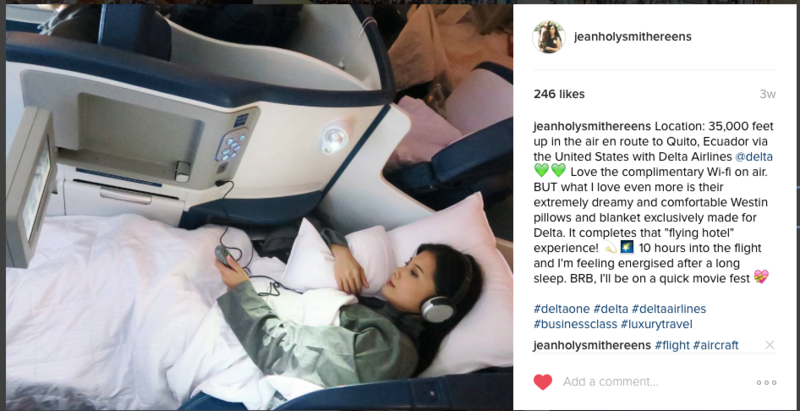 I agree, what I found really impressive was how comfortable my sleep was despite the actual seat being an older business class model. I think the beddings really made a difference! I loved reading your reviews on both Delta & Virgin. I am interested to know, have you tried Economy Comfort with Delta to or from Los Angeles? I would be interested in your thoughts if you have. Hi Helen, thanks for the visit and I’m glad to know you enjoyed reading my reviews! 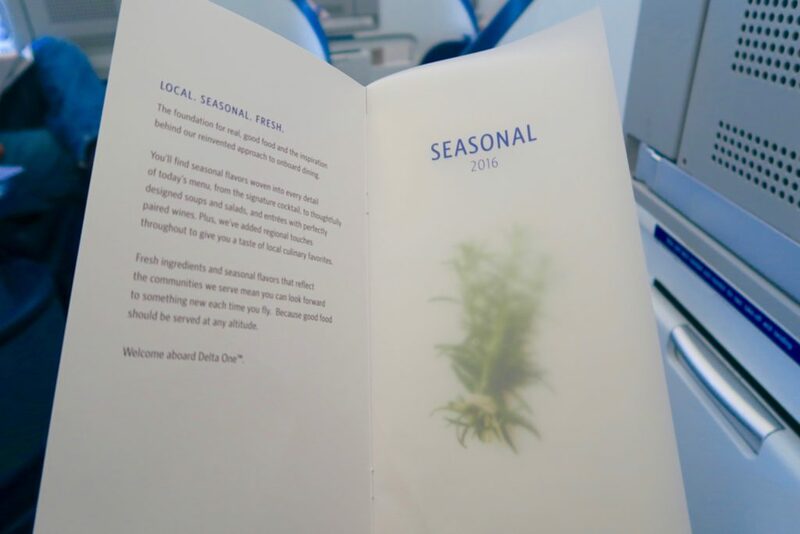 I have not tried Economy Comfort with Delta. From what I’ve read and heard, the seat size is the same, but there is 50% more recline than normal and with 4 inches more of legroom plus free wine + spirits/ snacks and priority boarding. I’ve read mixed reviews about it but for a maximum of $160 per leg on a long haul, it seems pretty reasonable and I personally wouldn’t expect much more than those extras.